Almost three decades ago, I began concentrating on Small Business Administration (SBA) lending to help our small business community. Today, I’m proud to say that our team here at Heritage Bank continues to work with hundreds of businesses each year to secure the capital they need. This not only helps grow their business, but it also helps create jobs in our communities. For those who may not be familiar, there are two main types of SBA loans: the 7(a) loan and 504 loan. The 7(a) loan can be used for a variety of needs—including working capital, fixed asset purchases, business acquisitions, start-ups, etc.—while the 504 loan is designed to provide financing for fixed asset acquisition only, such as commercial real estate and/or large equipment needs. Both loan programs can also be used to refinance debt that is currently on unreasonable terms. In the case of an SBA 7(a) loan, SBA doesn’t provide the actual loan. Rather they guarantee loans made by financial institutions, like Heritage, who participate in the SBA program. What drew me to this area of lending was the fact that an SBA loan can make a big difference to a small business. In many cases, by utilizing SBA programs, the bank is able to lend to businesses that aren’t able to obtain a conventional commercial loan due to lack of collateral or the start-up nature of the business. Small businesses can be more vulnerable to fluctuations than large corporations, so SBA loans offer longer terms with no balloon payments or prepayment penalties. That means lower payments for the business, which translates into better cash flow and the ability for the business to build up their working capital in case they hit a rough patch down the road. Of course, an SBA loan isn’t for everyone but for the right fit, it’s a great solution. I appreciate that everyone here at Heritage Bank recognizes that this type of lending is a specialty and we’re all committed to offering it as an alternative for our small business community. As you can imagine, SBA’s guidelines are incredibly detailed, but Heritage Bank’s preferred lender status (“PLP”) means that we’re able to approve loans on behalf of the government due to our positive track record over the years. While many bank and non-bank lenders offer SBA loans, there’s a difference here at Heritage Bank. In part, because I believe it’s more than a transaction to us—it’s a relationship. We work hard to understand where the business has been, where it’s going, and what it needs to be successful in the future, and we’ll tailor our products to fit the business’ particular needs. I’m honored to lead the SBA program at Heritage Bank. To me, it’s another example of how we’re grounded in our communities, while offering the expertise and resources of our entire community of banks. Christine Heckert is the senior vice president – SBA manager at Heritage Bank. Christine joined Heritage in 2014. She has been in SBA lending since 1988, and in 2008, she received the Financial Services Champion award from the SBA Seattle District. She has a Bachelor of Business Administration from Gonzaga University and is also a graduate of the Washington Bankers Association Executive Management Program. 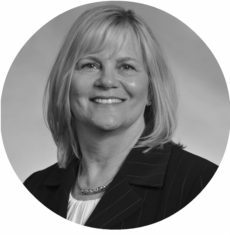 Christine also serves on the Technical Issues Committee and the Region X Liaison Committee for the National Association of Government Guaranteed Lenders, which is a trade organization for SBA 7(a) loans.